These original technologies from the Faith Group were granted process patents in 2015. ・These revolutionary technologies from the Faith Group, which are the first of their kind in the world (*1), allow collagen, which does not penetrate when simply applied to the skin, to penetrate into the stratum corneum by wrapping it around nano capsules. ・They were developed jointly with L.V.M.C. Inc. (*2) and comprise the heart of the Lamellar Beauty Method being promoted by the Faith Group. 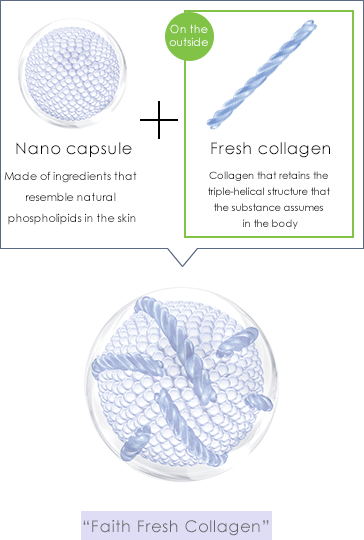 Fresh collagen (*4) with a triple-helical structure is wrapped around nano capsules, and then the formulation is freeze-dried to maintain freshness. Dissolve the product in the included water before use. Fresh collagen with a triple-helical structure has about 600 times greater water retention capacity (*5) than hydrolyzed collagen. 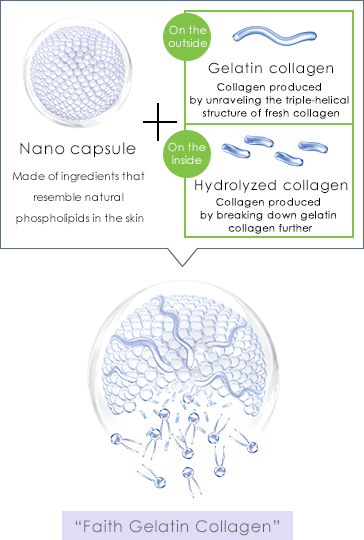 We focused on facilitating penetration into the skin by wrapping gelatin collagen (*6) around nano capsules and then encapsulating hydrolyzed collagen (*7) inside each capsule.